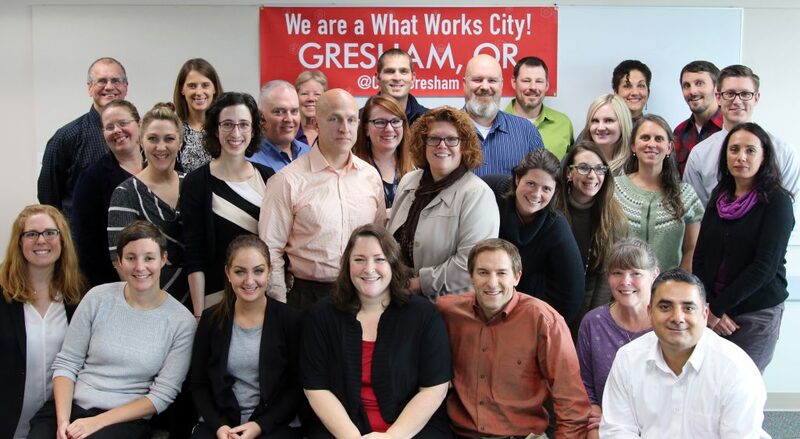 With help from What Works Cities partner the Behavioral Insights Team (BIT), staff in the City of Gresham are developing the skills to take on complex city challenges one step at a time using behavioral science. March 17, 2017 – Local governments are often asked to solve complex problems with no easy answers: “How do we make our community safer?” “What do we do to improve livability? “How can we meet the changing and increasing service needs of the community without increases in revenue?” With big questions like these, it can often be difficult to know where to start. BIT developed a framework that starts by breaking down complex problems like these into smaller, more manageable pieces. Once the issue is split into the separate, individual actions required, it is possible to identify an individual behavior that, if changed, could make a big difference in the ability to achieve the objective. Once a particular behavior is identified as a barrier, BIT uses research from behavioral science to develop evidence-based solutions, then rigorously tests them to see if they are effective. 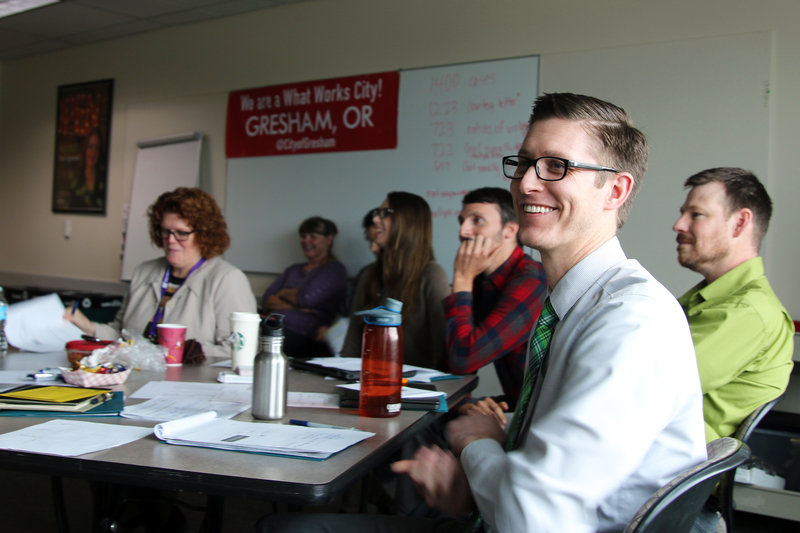 As part of its engagement with What Works Cities, the City of Gresham is learning how to use the BIT framework to increase the effectiveness of our city services, programs, and operations. In October 2016, we partnered with BIT to host a two-day, hands-on, intensive “BIT School” training on how to apply behavioral science to policymaking. After receiving an overview of behavioral science, randomized control trials, the BIT framework, and examples of how other cities are using BIT approaches to address priority areas, the 40 BIT School participants, who represented 19 divisions across City Hall, worked in small teams to tackle the following policy challenge: How can the City of Gresham use behavioral insights to increase compliance with residential code enforcement? Following the principle of learning by doing, the teams conducted fieldwork to understand the code compliance and inspection processes, brainstormed innovative interventions, and designed a randomized control trial to test their ideas. At the end of BIT School, each team pitched its proposal to a panel of judges, which included City Manager Erik Kvarsten and Assistant City Manager Rachael Fuller, to select a winning intervention to be implemented as a formal trial with BIT. That intervention could, for example, test the effectiveness of variously worded messages to convince residents to pay a fine and/or address a property violation. The right message would potentially save resources and personnel time for the City. 1. Expertise in a given policy area is not required to design an effective intervention. In fact, employees from other departments offer a fresh and valuable perspective. In Gresham, we saw that BIT School provided an opportunity for employees across the organization to gain a better understanding of all City services, which benefits the day-to-day work they do in their respective departments. 2. Humans are hardwired to take the path of least resistance whenever possible. That means any additional effort required to do a particular action can have a dramatic impact on the likelihood that we actually do it. With this in mind, BIT developed the EAST framework to use when designing interventions. Encourage the desired behavior by making the idea EAST: Easy, Attractive, Social, and Timely. 3. Not every good idea can be tested. Sometimes, even when great ideas emerge, there is not a large enough population to test the intervention, or it is not possible to track the randomized control trial’s outcomes. However, there is still value in working through the EAST framework to make positive changes to programs and services, even if it is not possible to test them formally. Looking ahead, Gresham has identified several areas to which we want to apply the BIT framework and run randomized control trials. And thanks to BIT School, Gresham is equipped with new tools and knowledge to continue building an evidence-based and data-driven organization aimed at improving operational effectiveness and service delivery. Stephanie Betteridge works as the Senior Manager of Technology at the City of Gresham, where she is responsible for the Strategic Technology Initiative, Project Management Program, and data and analytics and is active in many organizational and business process improvement efforts. A native Oregonian and dedicated public servant, Stephanie has spent the past seventeen years working at all levels of government, including the Bureau of Land Management, the Center for Evidence-based Policy at Oregon Health and Science University, and over ten years with the City of Gresham. Ashley Sonoff is an Associate Management Analyst at the City of Gresham. She is energized by challenging tasks and committed to finding solutions that are innovative, sustainable, inclusive, and equitable. She is skilled in policy analysis, program evaluation, community engagement, and quantitative analysis. Ashley holds a Master of Public Administration from the University of Washington and a Bachelor of Arts in International Studies from George Fox University.